Dezurve is a curated library of hundreds of articles, blog posts, and white papers covering all aspects of marketing, sales, and client retention. This isn’t frustrating theory, but the real deal. We’re talking practical, nuts-and-bolts strategies, tactics, and techniques, often drilling down to the dialogue level. Lawyers learn at their convenience, in small chunks of time that they can squeeze in whenever they have a few spare minutes, anytime, anywhere. Here’s an example that’s just in time for the holiday networking season. It’s a four-part series showing how to convert a dreaded, anxiety-producing obligation into an enjoyable and productive experience. Please share these with your associates. They’ll thank you. While associates are learning about business development, in the background Dezurve is tracking their activity, collecting data that tells your firm which of them are consistently devoting time to learning. It gives you objective evidence to inform decisions about which lawyers are serious about learning these critical skills, and therefore deserve additional investment. Our surveys show that law firms estimate that 80% of the money they spend on training and coaching is wasted by lawyers who don’t take advantage of it. And it doesn’t matter much how you choose them. There’s no way to predict who’ll perform and who won’t. Observed behavior is the only reliable predictor of future behavior. We know how busy you are, too. The last thing you need is another program to manage. Dezurve doesn’t add any management burden at all. Setup and onboarding takes 20 minutes. After that, you don’t have to do anything until you have an investment decision to make. Then, Dezurve’s color-coded report tells you at a glance who your best training/coaching bets are. Unlimited access to Dezurve is just $20 per year, per lawyer. That’s about what you’d spend to buy a lawyer a holiday cocktail in a major city. Studies show that lack of training is the #1 reason for associates leaving law firms. For a pittance, your firm can demonstrate that it values its Associates, and is committed to helping them prepare for a successful career — but that it’s a two-way commitment. 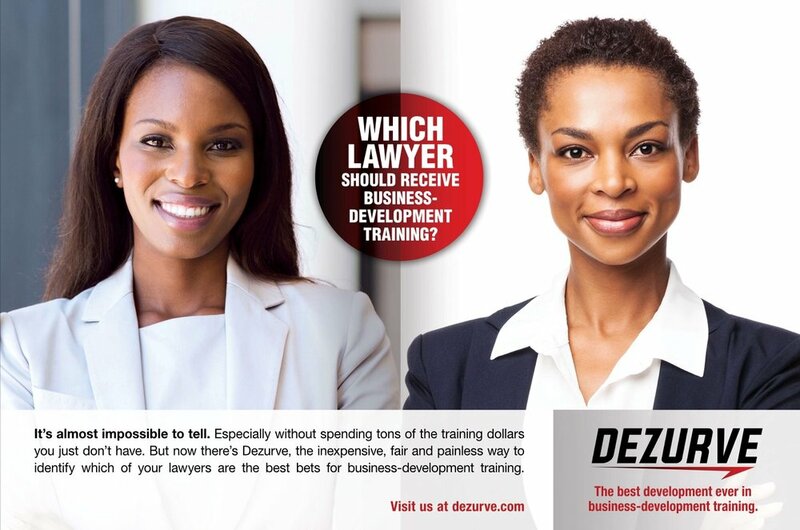 Let’s discuss how Dezurve can help your firm’s Associates learn critical biz dev knowledge, and begin learning the skills that will define their futures. Or, schedule a call with me. Or, if you don’t want to delay at all, call me now at 702-879-4837.